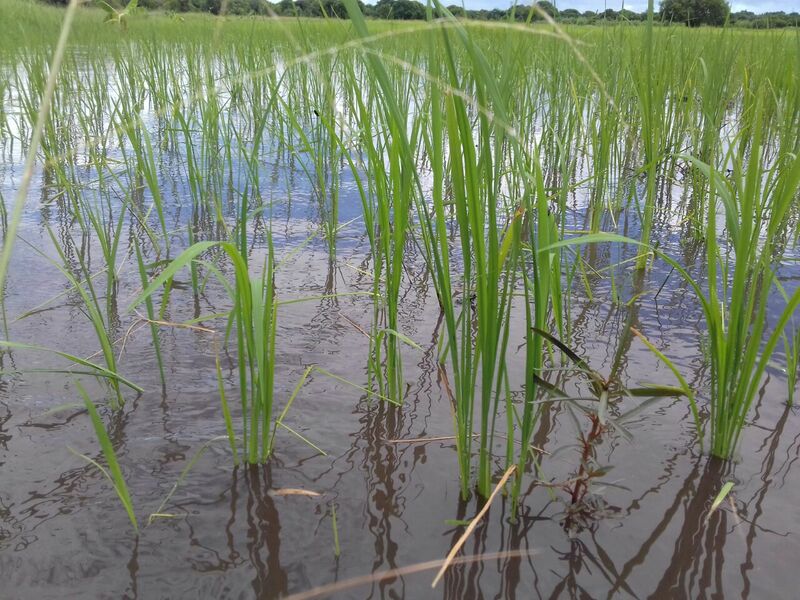 We are some way from the tropical storm that devastated coastal areas in the south of the country but are having good rains and are excited that the rice crop should be a good one this year on the Africa Naturally farm. 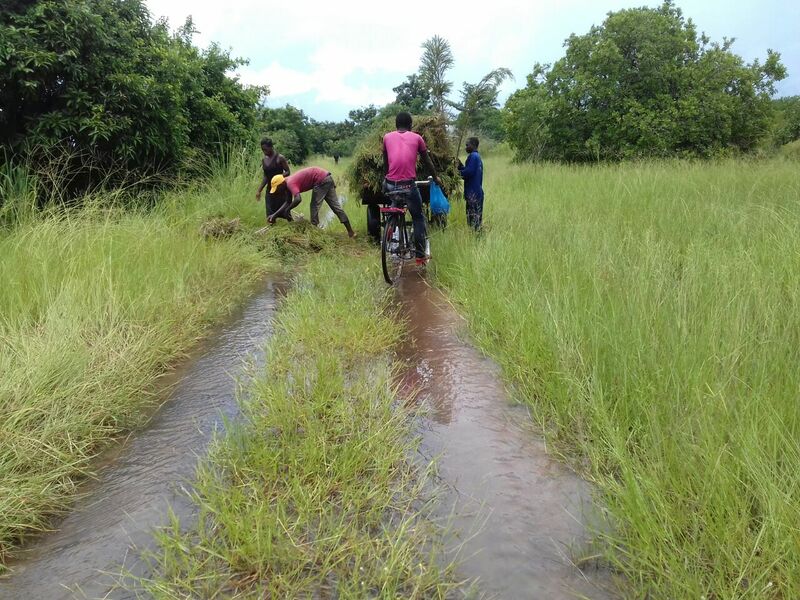 We are all praying for an abundant harvest for the orphans and their carers and for all the family subsistence farmers that rely on growing food to feed their families. This week the team, led by Armando, have been learning in their after lunch bible studies to acknowledge God and God alone, that they can walk away from witchcraft, ancestral worship and put their trust in God. Proverbs 3:5,6: ‘Trust in the Lord with all your heart and do not lean on your own understanding. —— He will make your paths straight.’ Also about giving, to turn from a receiving to giving mentality looking at Luke 6:38 and Proverbs 28:19. Sometimes we have people who turn up to join in and this week two ladies, who are growing crops for their families ‘illegally’ on the farm, joined the others to hear these messages. They had heard about the ‘different’ way to grow the crops and came to find out more. I would like to run a series of FGW training days when I’m next there and encourage all those farming illegally on the farm to come along. FOM team Luis, Francisco and the son of Joaquim have been spreading compost on the vegetable field in preparation for sowing in April. Joaquim has been unwell since early in December so his son has joined us in his place. Please pray for Joaquim. 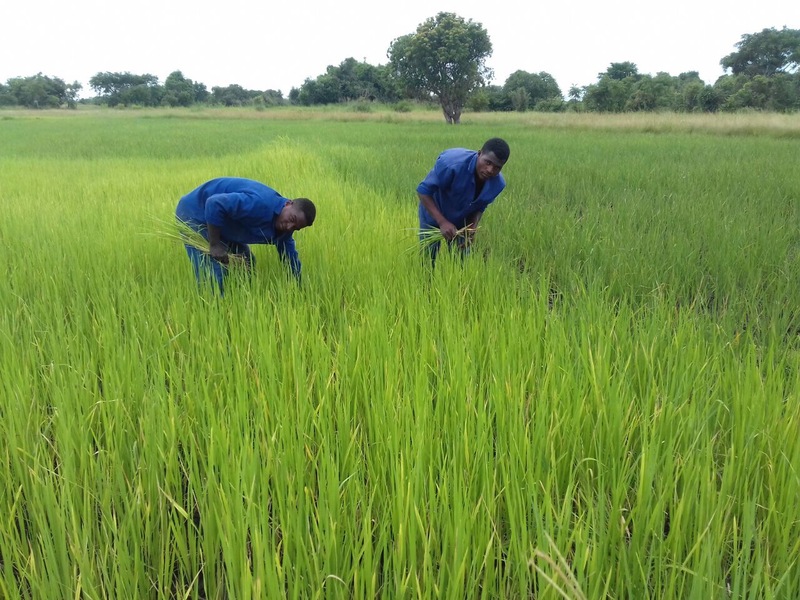 Jose and Elias, two of the three young men who grew up in the orphanage and are now on our apprenticeship programme, have been weeding in the rice field and harvesting maize. Joao, the third, has been missing from the farm for four days and from his home on Pastor Rego’s/Mountain of Praise church land, for three days. Please pray for Joao as no one knows where he is, that he is in God’s hands and will be brought safely back to us. 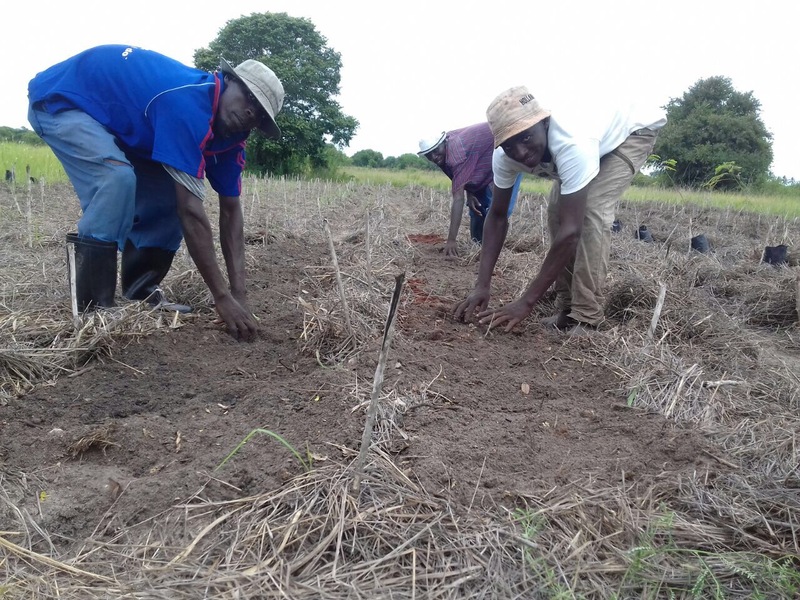 This year for the first time we have prepared a demonstration field for crop rotation of maize (October to March), beans, (more or less possible all year round) and sweet potatoes (May to October). 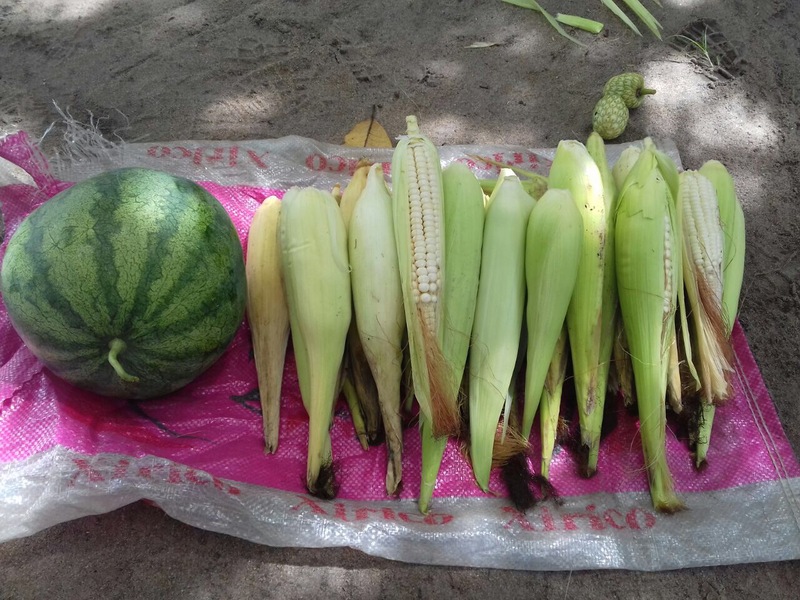 This week the harvest is one melon – they pop up occasionally, we don’t farm them – and 40 maize cobs, all for the orphanage. 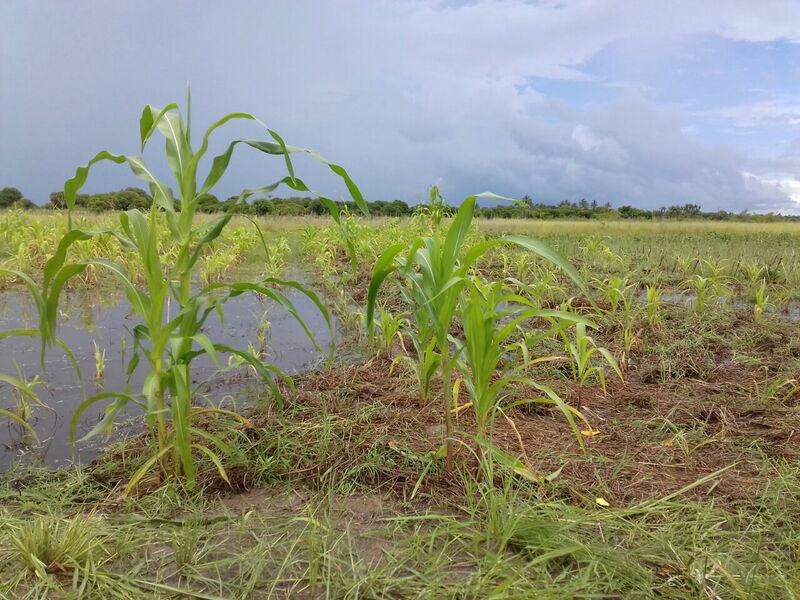 The maize has not been totally successful as the rain caused water logging and we learnt that the field needs to be levelled properly and with plenty of drainage.